UPCO has been taking care of people who take care of pets for half a century. Veterinarians, breeders, groomers and pet owners have come to trust UPCO staff's extensive experience as a leading pet supply store. They offer easy access to wholesale pet supplies and equipment to pamper, play with, care for, train and groom your dogs, cats, horses, birds, reptiles and other small animals. UPCO makes playtime fun with a variety of bird toys, bird play stands, swings and bird perches - only the finest for your feathered friends from the company that's been serving pets and pet owners since 1952! Whether you are starting out and need bird cages and other basics, or are just looking for some new bird toys for a feathered friend, visit the UPCO website today! 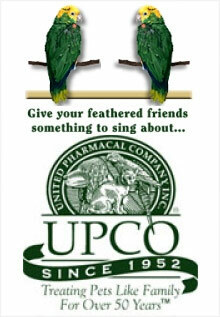 See why UPCO is the most complete pet bird supplies store on the Internet.